Meet Rande. He's a level 5 Khajiit Nightblade named after my dead cat. 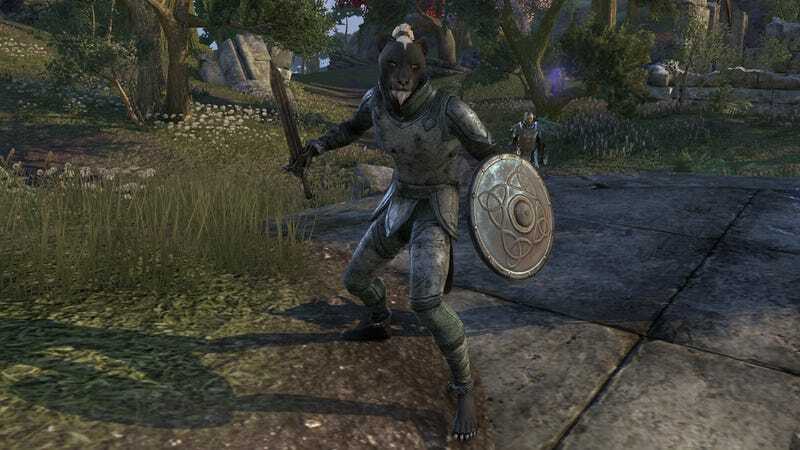 He'll be my representative in the world of Tamriel as I spend the next several weeks playing The Elder Scrolls Online for review. I created Rande last night, after picking up a copy of the digital standard version of the game directly from Bethesda in order to take advantage of the five day head start afforded such purchasers. Tomorrow begins the three days of early access granted those who preordered the game anywhere else, leading up to the game's full launch on April 4. This staggered access should give players and the Zenimax Online folks a good idea of how well the game servers will hold up to a heavy load, in case the multiple beta stress tests held over the past few months weren't enough. Right now the game is running smooth and buttery for me, with no noticeable lag or obvious bugginess. I like that in an MMO launch. As for my gameplay plan, it's hard to say. Right now Rande is dealing with a book obsession, increasing random skills by entering every building he sees and raiding the bookshelves for undiscovered tomes. I'm sure he'll snap out of it soon. I'll be posting a series of three or four weekly logs of my progress, beginning this weekend, leading up to our full review. That's how we do MMO reviews — a couple days live plus beta experience just isn't enough. Stay tuned for much more on Rande's adventures in Tamriel!